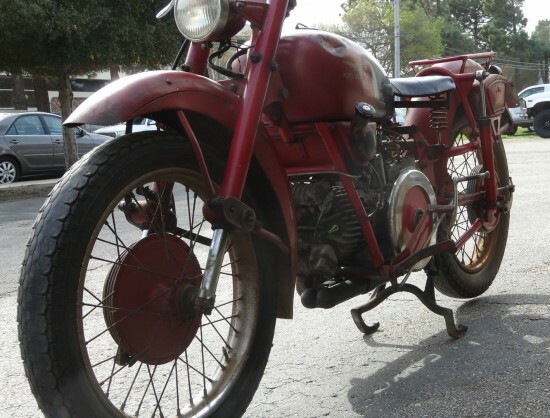 1950 Moto Guzzi Astore for Sale! 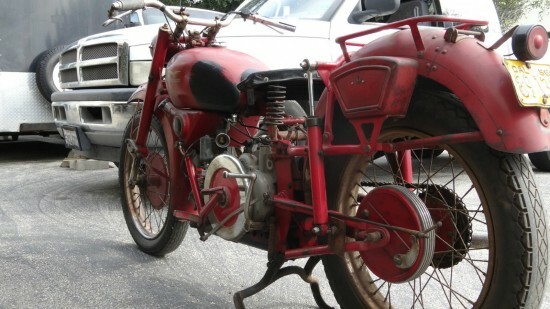 It’s been a banner week for vintage Moto Guzzi fans… If you missed it, I posted up a 1934 Moto Guzzi 500S yesterday. Today’s Astore or “Goshawk” was an update of the GTV, itself a development of the 500S, and was followed by the iconic and long-lived Falcone. The Astore was produced until 1953 and featured an aluminum alloy cylinder head and barrel, enclosed rockers, and improved brakes. Also, note the upside-down telescopic front forks: how advanced! Like all Guzzi big singles, they were low-revving, hugely torquey machines that provided very reliable, accessible performance. I purchased this Guzzi from the Estate of the gentleman who purchased the bike from George Disteel’s estate. 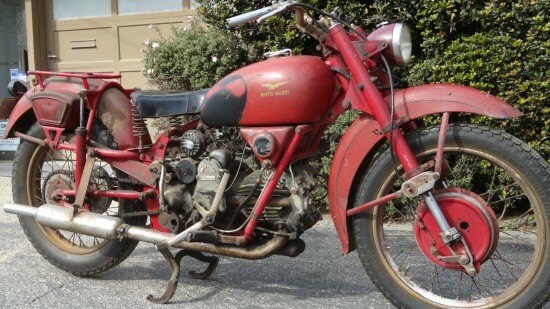 Basically, George bought the bike (it entered CA in 1956 and the last registration expired in 1957), moth balled it – not sure if it was chicken coop or not, then the next guy bought it at the Disteel Estate Sale in 1978- and kept it is his large collection until I bought it from his Estate Sale about 5 years ago. At first, I was excited to do a full restoration of the bike since it is in such incredible original condition and complete. Then as I was reviewing the old paperwork, I recognized the name George Disteel and thought “isn’t that the guy who went crazy and squirreled away Vincent Black Shadows, Two Guzzi’s and an Aston Martin in Chicken Coops on property he owned on the North Coast of California? As it turned out it was, then I even found photos of this bike from that era (I’ve included one and also a photo of George Disteel). I have another Astore, so I didn’t bother restoring this one, it really doesn’t need it and the history is much cooler to preserve (In my humble opinion). Again, the bike is complete and Probably has next to zero miles on it, never been torn down. I listed 1000 miles as you must list some sort of mileage, but Guzzi’s didn’t start having Tach’s and Speedo’s until the 60’s so I have no idea. Based upon my knowledge of George Disteel and then the second owner, I really think this bike has not been ridden much if at all in it’s 60 or so years. I think it would love to be ridden though. Vintage Guzzi’s are pleasures to ride. At the very least, an old Guzzi should be made to run, so hopefully this one does, or can be made to do so without too much trouble. Not much time left on the auction, so go take a look! 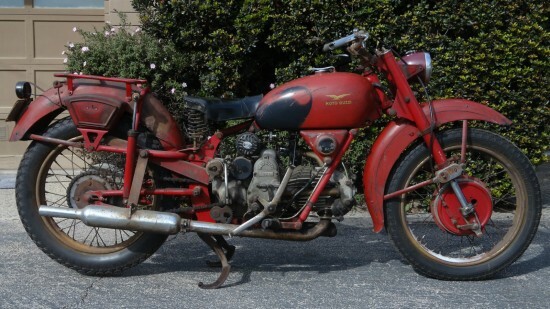 Previous story 1934 Moto Guzzi 500S for Sale!